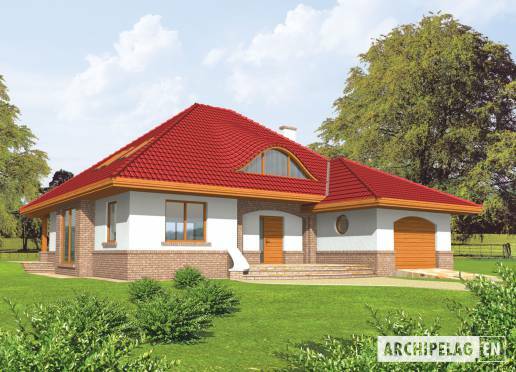 A one-storey house with functional attic, without basement, with built-in garage, intended for 4-5-person family. On the ground floor are daily room with pantry and dining room, guest room and big utility room. A night zone on the attic are bedroom with bathroom, 2 rooms with wardrobes and big bathroom. There is also a version of that house plan with 2-cars garage and alternative roof construction. A roof designed in bricks technology with suspended beam and block floor. Internal wooden stairs. A roof of wooden structure tiled with ceramic or cement. Facades finished with plaster and clinker siding. Woodwork windows.